As a small child, I had a very severe head trauma that resulted in a total paralysis of my left side. After several years, the paralysis disappeared, but I needed many surgeries and wore a half calf brace so I wouldn’t fall over. While working at Pendleton Woolen Mills as a certified Credit Manager, my physiatrist found my left leg was shorter than the right leg by more than half an inch, and he suggested a cane. A neurologist helped me manage my muscle spasms. Because of my fear of heights and balance issues, I chose to do mostly water and pool therapies, but then a friend who was suffering from a nerve issue introduced me to Forward Stride. 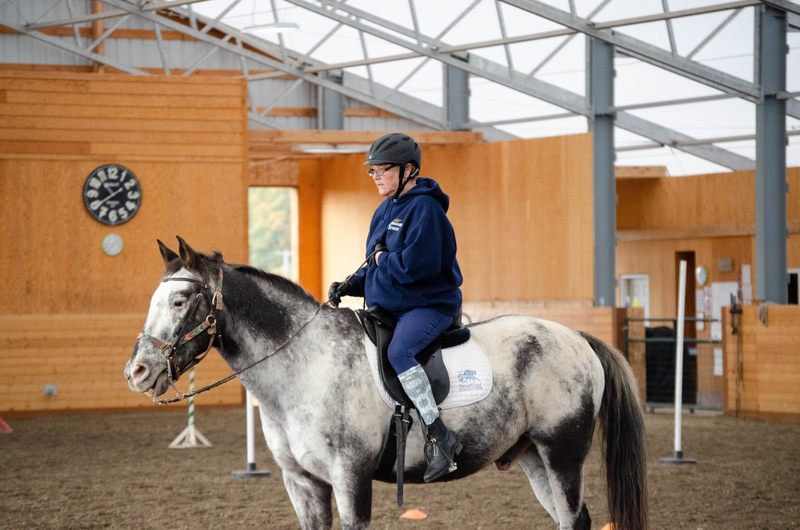 She invited me out to the barn one Saturday, and after watching a young boy who had difficulty walking have a successful ride, I came home thinking about how Forward Stride might help me. I started riding with the program in Spring of 2013, and that was the beginning of much mental and physical improvement. I found my sense of balance; and there is a sense of comfort, joy, and empowerment that I get being on a horse. I’ve had success with ground pole work, weaving through poles, going through a maze, moving backward, lunging a horse (which I love) and after lunging Lad I had the special experience of a “join-up” (still a highlight!!!) during a ground work lesson with Kris. I also enjoyed my quiet night rides with Nicole that were free of busy daytime distractions. 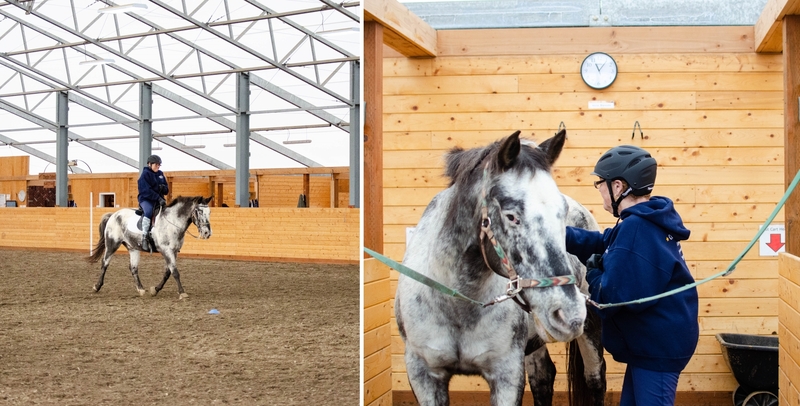 My husband has supported my riding and likes to visit the horses when I have my lesson. 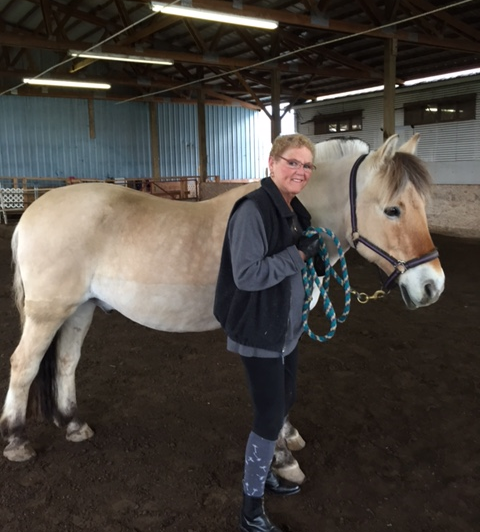 For the past 2 years, I have been riding Dusty, and his owner Amanda has shown me how to groom and handle him safely. Gradually, I’m learning to help untack and can take the English saddle off of Dusty. One of my favorite times at the barn is when I’m grooming Dusty, it feels like we are giving care to each other and it helps my left hand relax. I feel his warm breath and he gives me a gentle nudge… pure joy. 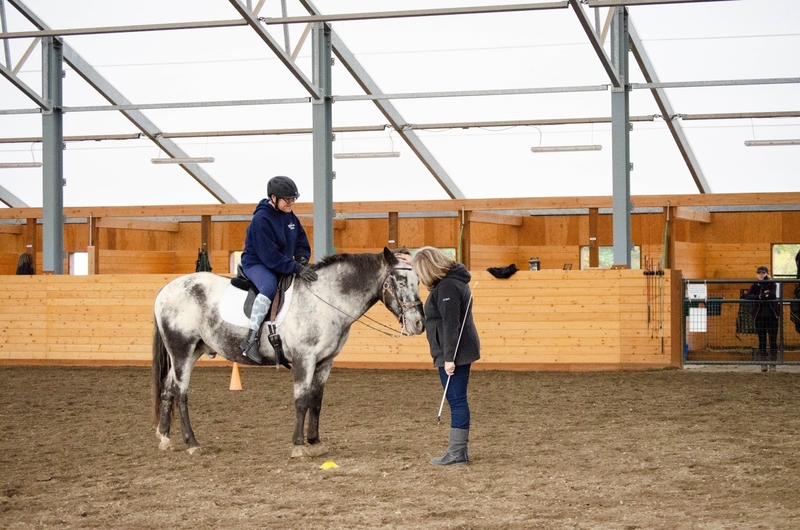 Earlier this year Amber (Forward Stride’s Executive Director) analyzed my riding, saddle, and reins, so that I can reach my goal of trotting. I’m learning to trot with my instructor Pati and am now able to do some trotting on my own. Pati has been a very supportive and firm teacher, which I enjoy. Amber and the entire Forward Stride family are so positive and eager to answer questions or help. Things that I thought I couldn’t do before, I can do now… what a joy it is to gain confidence. My doctor sees my improved posture and core strength, as well as increased strength on my left side. Honestly, Forward Stride has been a blessing, and I’ve had success with things that I never thought were possible… completely blasting away thoughts of limitations! The horse is a magnificent animal and one thing I have learned is the value of “patience.” Best, Betty. Make sure our clients like Betty can continue to “blast” away thoughts of limitations for years to come by donating to our programming below!